As the Midwest continues to be crushed by the polar vortex, I found myself wondering just how operations have run this year. There have been several bad weather events that have snarled operations, so I was expecting it to be a mess. At least for the five biggest US carriers, on-time performance has been surprisingly decent, but that comes with a cost. Cancellation rates have been high. Every airline has approached operational performance differently, so let’s take a look in greater detail. I dove into masFlight’s data for January 1 through January 28 of this year to compare the 5 biggest airlines in the US. Here’s what I found for basic on-time performance for the big 5 including regionals. That last one is the DOT-published metric that you most commonly see, but there’s one more thing we need to look at to get a complete picture. Here’s the percent of completed flights by marketing carrier for the same time period. With these two graphs, we can get a real sense of how each airline is running its operation. They’re actually quite different, so let’s dig into each one. If you start on the left of the top graph, you’ll see that Alaska looks good. It has rebounded from its poor Virgin America-induced performance to now being able to get airplanes off the gate in a similar fashion as the reigning champion, Delta. But when it comes to arrivals, Alaska is down toward the bottom. This clearly shows that Alaska is scheduling tight block times, the time from when the airplane pushes back on departure to the time the seatbelt sign goes off on landing, roughly. In fact, its B0 — the percentage of flights that complete within the scheduled amount of time — is far lower than everyone else at just above 61 percent. (Next lowest is United at 68 percent.) You’ll see that has Alaska near the bottom when looking at A0, but since it gets so many airplanes off the gate on time, it ends up toward the top when it comes to A14. While Alaska does come in second for completion factor, that number is still nothing to crow about. I think we can probably call this “the San Francisco effect.” Clouds in San Francisco makes for a rough operation for any airline. And now that Alaska is flying around there much more frequently thanks to the Virgin America acquisition, it probably has to cancel a lot more flights in order to keep the non-canceled flights running closer to on-time. Does this tight block scheduling matter? Well, since Alaska is getting airplanes off the gate on time, that tells me it is probably building in extra ground time for aircraft turns so it can catch up when planes are late arriving. That combined with a fair number of cancellations means that Alaska can get airplanes going on time throughout the day. Arrivals may be a bit late, but that seems like a calculated risk here. If you want to see the polar opposite, just look at Southwest. Its gets shockingly few airplanes off the gate on time. I mean, it’s not even close. It makes up a lot of ground in that first 15 minutes, however. Then while its arrivals tend to be far below Delta at first, by the time we get to A14, Southwest has surged into being just a hair shy of Delta. What’s going on here? Southwest has a lot of block padding. Its B0 is the highest here at 77.4 percent. To me, this looks like a case of an airline that probably has its turn times too short, or has at least decided to trade short turn times for long block times. It can’t get off the gate fast enough, but it has enough block time padding so that by the time it arrives, it has mostly made up for it. Meanwhile, it has canceled a lot of flights, even if that number is middle of the pack for January. I’ve generally thought of Southwest in recent years as an airline that might not get you there on time, but it’ll get you there. That January cancel rate doesn’t reflect that. American has had a really rough go of things from an operational standpoint, but in this chart, it looks like January hasn’t been too terrible for the airline. In fact, American looks pretty average in here. It gets airplanes off the gate at an ok rate and gets them back on again at a decent rate as well. Its B0 is 68.9 percent, so that’s again pretty average. Its completion factor is not good at 97.5 percent but that too is middle of the pack. For once, American isn’t an outlier, and sadly that’s considered a positive sign. Because when American is an outlier, it’s never on the positive side of things. At first glance, United and American look pretty similar. United gets about the same percentage of flights out on time as American, and with a B0 at 68 percent, it’s again similar to American. But take a look at what happens at D15 and A14. United is the one airline that can’t crack 80 percent in those two metrics. In other words, when a United flight takes a delay, it has a better chance of taking a long delay than on any other airline. What’s even worse is United’s dismal completion rate. With more than 3.5 percent of flights canceled in January, United should be embarrassed. This is likely a hub problem. Newark, Chicago, and San Francisco have had their issues this month. But that’s just the nature of flying in those markets. You have to plan more slack if you want to perform better. Speaking of planning more slack to perform better, it’s time to talk about Delta. As has long been the case, Delta is the operational champion. It gets the most airplanes off the gate on time and the most back in on time as well. And just look at that completion factor. Less than 1 percent of flights canceled when when none of the others could crack 2 percent? It’s a beautiful thing, but it doesn’t come without cost. Delta has a fair bit of schedule padding with a B0 of 77.3 percent, just a tenth of a point behind Southwest. I’m guessing it probably has more spare aircraft as well to help avoid cancellations. But Delta has made the calculated decision that flying a solid operation can be a competitive advantage. It may be costly to run an operation like this, but Delta thinks there’s revenue benefit to be had by running better. It’s hard to argue with Delta’s numbers, though it’s not clear how much operational performance contributed to that. From a business perspective, it’s hard for me to know what the right mix is here. But as a customer, once again Delta finds itself looking like the most attractive and reliable option. And customers should do everything they can to encourage the success of that type of operation. I don’t generally find time departure/arrival stats all that interesting, but your analysis here explaining the “why” and the likely operational strategies affecting these numbers is quite fascinating. Thanks for responding to reading requests (like mine) and including Southwest in this analysis. I’m interested to know why you didn’t include JetBlue in the mix. They’re not really any smaller than Alaska, and their stats would have definitely made everyone else look better in comparison. Mike – I had to draw the line somewhere. Alaska is more interesting than JetBlue. JetBlue is consistently bad at running on time, so I didn’t bother to include them. I believe that Delta’s completion rates (and if not others) can be very misleading based upon some of their delay strategies. From my observation, in lieu of cancelling a flight, they’ll simply delay it (even to the next day) and eventually fly it as a repositioning flight to get the plane back into place. They still count those as completions as the flight eventually completed, even if it was empty because everyone was accommodated on other flights. I’ve had this happen to me on a SNA-ATL flight where one of the plane’s PACKs went out of service and they couldn’t fix it in time to get out before the airfield closed, so I ended up with a 20 hour delay, leaving a the day after the scheduled flight (in a 757 that had less than 20 people on board). Shouldn’t the stats require that to be counted as an incomplete flight? I’ve noticed this too. I’m often at our local airport (CHS) at some pretty odd hours and recently there have been several Delta flights – usually BOS or JFK – arriving or departing between midnight and 6am as a result of a substantial delay (12-24 hours) the previous day. It appears as if these are regular, albeit very delayed, flights with a boarding process, information on the monitors, etc. but for all intents and purposes, they’re just repositioning a very empty airplane at that point. I still prefer DL to the other big 3 for a wide variety of reasons, but it wouldn’t surprise me if their flight completion rate is a little artificially inflated. +1 to that. I recently had ATL-DAB “delay” to the next day, leaving me and my wheelchair-bound dad in Atlanta. (We ended up going to JAX, but then had to figure out appropriate ground transportation.) Annoying to think that the original flight would still count as “completed”. It should not be an incomplete flight in statistics, because it was completed. Taking any one stat and saying that it tells the whole story is the wrong way to go and that is why Cranky used both departure/arrival delays PLUS completion. I agree that Delta has been employing the “delay until tomorrow” strategy more than others, but if they did that too much then their departure/arrival delays would show that they are skirting the stats by using that approach. 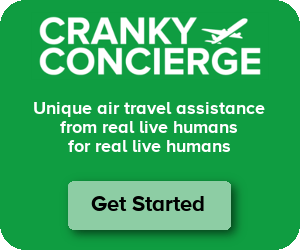 It is clear from what Cranky presented that they are #1 on both completion and departure/arrival delays, meaning that even though they do their overnight delays from time to time – they must not do it often as that would show up in the departure/arrival delays. Add me to the list of folks who’ve experienced this, albeit not quite to the same degree. ATL-PBI in May 2017, second-to-last flight out of the evening as I recall. The MD-88 I was on couldn’t get one of the engines to start. Twice. Eventually the flight was “rescheduled” to 6a the next morning. I rebooked on a 717 for early afternoon instead. I’ve had a flight delayed 12 hours and I was put on Alaska instead. But, a completed flight is a completed flight. Besides, it’s a strike against their on time rating. Considering Delta are still the most on-time airline with the least cancellations, they must be doing something right. I agree that DL does pad their schedule more than others but as the customer I see that in the published schedules so I can arrange my time around that. The alternative is I pad my own schedule by flying in hours in advance, or even a night before, just to be on-time to my commitments. That’s inefficient if there isn’t a delay and if there is one it’s a gamble you built in enough time for whatever that delay is. Either way, in the world of time is money it’s wasteful. We all want the airlines to run on schedule, yes? The way I see it, Delta’s continued operational performance is the best bet for my business to stay efficient. and yet Delta is now running the second most profitable US airline by margins behind Southwest. Both have considered that the number of flights that arrive early offsets the number that are delayed and make it worth it for them to correctly claim they run a more reliable airline which is valuable to many customers. On the other hand, airlines like JetBlue schedule their network very tightly even while operating out of some of the most congested and delay prone airports. As for Delta’s extensive delays instead of cancellations, other data sources show that Delta’s average delays are at or below other carriers. in other words, the very few extensively delayed flights are not enough to affect their overall on-time, meaning their average delays for not extensively delayed flights is at or less than other airlines. and the extreme weather and high cancellation rates are bound to affect first quarter earnings for American, United, and Southwest. Maybe I’ve always been lucky, but in 19 years of flying United (almost exclusively) 50k annually, I’ve only ever had one delay of more than half an hour (when the cockpit door fell off a 757 at IAD…); but they clearly have work to do compared with the other biggies (accepting having hubs in weather-sensitive cities as being part of the reason). You have an unfathomably good run of luck! Just out of curiosity do these data include the last few days of January? Southwest basically shut down at Midway during the polar vortex. It seemed thah other airlines at O’Hare were doing slightly better but maybe thah was observer bias. Struggle – As noted in the graphs, this goes through January 28. If you had employed a 0-100% scale those bar graphs would be a lot tighter together. that roughly equates to DL cancelling 3,700 more flights if it operated at UAs completion factor. i’d say that’s a big deal. Not saying it’s not a big deal from an operational standpoint. I’m just saying the bar graph is not visually accurate given the actual numbers at play. Agree with Douglas here that without the scale, “height” of bar graphs is misrepresented. Having said that, giving Brett the benefit of the doubt because you still get the point he was trying to make. I’m normally pretty picky about perceived manipulation using graphs, but I give Cranky’s graph a pass. For one thing, he has the data labels on it, and for another, cancellations are a big deal, even if the difference in completion factor between carriers is small enough that any perceived differences across different carriers in a given month will be little different from random variance for all but the most traveled road warriors. Put another way, you could show the same data as “Cancelled flights per 1,000 scheduled flights”, with an x-axis intersecting the y-axis at 0, and United would look 4.5x as bad as Delta (36 vs 8). This is very interesting analysis on metrics we see every month. Thanks, CF! It is interesting to hear month after month about DL’s completion factor. Even today they are not canceling nearly as many flights out of MSP with the polar vortex. Seems somewhat confusing given UA and AA have canceled the majority of their ORD operation. Excellent analysis, as always, Cranky. One additional item to consider when you think about airlines operational performance is the Regional carriers. As United has the greatest percentage of flights assigned to their regional partners it impacts the customer experience. As you note, United Hubs are in cities that have weather challenges I find a huge amount of regional cancellations due to ATC initiatives and this get lost in both the regional “controllable cancellations “ reporting. While the schedule may look appealing to book far too often we miss our connections. I just can’t trust them as I can the Delta operations and product offerings as the UA 50 seaters are a terrible product and unreliable. Jeff – Indeed. The regional do perform worse. For American, completion factor was 98.8% percent mainline which means regional dragged it down further. Though for flight that did go, mainline A14 was 81.9% so it wasn’t all that different. For United, mainline completion was 99.15% so it really just put the entire burden of cancellations on to its regional partners. That’s a huge problem. Same goes for A14 where United was at 80.6% for mainline. The regionals really got hit harder at United than anywhere else. Then there’s Delta. Mainline had a 99.8% completion with A14 at 86.9%. The regionals did lag a bit, but not all that much in the scheme of things. I work at Delta, and while it’s true that flights are often “delayed until the next day,” the more important story might be how much thought goes into fine-tuning our day-to-day operations. And I’m not talking in the C-Suite; I mean at the station level. As for the Polar Vortex, it sure sucked to work in these last two days, but UA and AA canceled almost their entire operations out of my station-we ran a full schedule. I’m willing to bet we picked up more than a few new customers from that. This is a really interesting point – I’d love to see an analysis of how the carriers have handled the cold weather differently. I’d like to see those stats as well once everything shakes out. I’m biased, but I believe DL gained a massive competitive advantage by merging with NW. 10 years on, and There is still a huge amount of institutional knowledge in stations across the upper Midwest. Add to that some really great ideas/pre-planning from the collective hive mind, and you have a good recipe for success. As an avgeek who enjoys reading about operations management topics in all industries, I’d be really curious to know how operations get tuned at the station level (beyond just airline HQ tweaking flight schedules). I know it’s proprietary, and I don’t expect anyone to risk their job by disclosing that info, but maybe I’ll eventually find a good HBS or consultancy case study to read on the topic. The real question is why has Delta been able to run Detroit and MSP at much higher reliability than all three of the largest airlines in Chicago. The weather in DTW and MSP was not significantly better than in Chicago. Lots of local business just shut down in Chicago. Did more people in Chicago just throw in the towel and hunker down in their homes than in the MSP and DTW? And let’s also not forget that Chicago is a large connecting hub so if that capacity is removed from the system of 3 airlines, there are passengers that end up on other airlines. I flew WN today through to of their focus cities and they still had plenty of empty seats – since WN gate agents sometimes announce the number of empty seats before boarding. UA wants to run a good operation, but doesn’t have the operational chops of AS and isn’t willing to sacrifice utilization like DL. It shows. And UA’s distraction with “year of the customer” doesn’t portend improvement. Look for a worsening operation and excuses about weather (“controllable cancelations!”). yup, once again the DL employees who don’t even know how to read DOT reports strikes again. Go read a DOT report, *any* DOT report, and you can see when you control for airport/metro region, DL fares no better than AA or UA or WN. same reason why HA is always way on top of most “on-time” reports – jeez so hard to run an on-time operation when there’s 364 days of sun every year. Your chart shows A and D but your text constantly refers to B which I assume are typos and supposed to be As. I would let Brett respond, but BXs refer to the percentage of flights that complete within the scheduled amount of time as he’s defined in the article. He hasn’t included a graph to refer to but the definition is there. Rich – No, those are different metrics. I explained what the As and Ds are in the post. B0 is, as mentioned, the number of flights that complete within the scheduled block time. So if you have a flight that’s blocked at 1 hour and 25 minutes, it could be 4 hours late but as long as it completed within 1 hour and 25 minutes then it would still count toward B0. It’s a measure of how accurate the block times are. No biggie but your URL for masFlight returns a 404. They’ve migrated to http://www.globaleagle.com/products/operations-solutions/masflight I believe. Your analysis puts a great perspective to observing the dataset from both ends.